This combination photo shows Fred Rogers as he rehearses the opening of his PBS show "Mister Rogers' Neighborhood" in Pittsburgh on June 28, 1989, left, and Tom Hanks at the London premiere of the film 'The Post ' on Jan. 10, 2018. Sony Pictures says the Rogers drama “You Are My Friend” starring Hanks as the beloved children's show host is coming to theaters on Oct. 18, 2019. 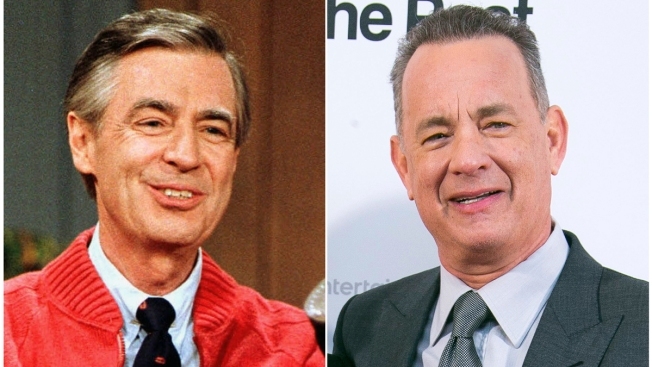 The Fred Rogers drama "You Are My Friend" starring Tom Hanks as the beloved television host is coming to theaters in late 2019. Sony Pictures says Wednesday that the film will be released on Oct. 18, 2019. The story is inspired by the real-life friendship between Rogers and journalist Tom Junod. Marielle Heller, who made the well-reviewed coming-of-age drama "Diary of a Teenage Girl," is directing the film. This year marks the 50th anniversary of "Mister Rogers' Neighborhood," inspiring a PBS special, a postage stamp and a feature-length documentary "Won't You Be My Neighbor," which hits theaters on June 8.